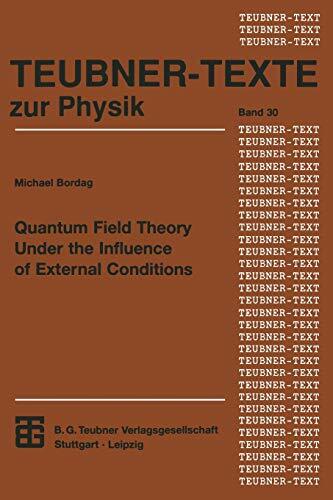 This volume contains papers based on talks delivered at the Third Workshop on Quantum Field Theory under the /nftuence of External Conditions held at the University of Leipzig from September 18th to September 22nd, 1995. This series of Workshops is organized by the quantum field theory group at the University of Leipzig. The first and the second Workshop in the row have been held in 1989 and 1992. The present meeting has been joined by more than 70 participants. This fact underlines the vivid interest in the field covered by the Workshop ranging from the Casimir effect to semiclassical gravity. The material of this volume is organized along five subjects. The first part is devoted to the Casimir effect itself. The actual interest is mostly in non-stationary boundaries and a possible explanation of the phenomenon of sonoluminescence - a still open and challenging question. The second part deals with QED and QCD in external fields. The main interest was focused on the effective action approach, on some aspects of the bag model and on quantum effects in a conical background. The ground state in external fields is studied in the contributions of the third part. They demonstrate that the zeta function regularization tagether with the heat kerne! expansion is the most powerful method at present. New calculations of functional determinants, of finite temperature effects and an interesting method applicable in the presence of smooth background fields are presented.